When word reached Henry that Becket was hiring armed men to protect him he said “What miserable drones and traitors have I nourished and brought up in my household, who let their lord be treated with such shameful contempt by a low-born cleric?” [History of Britain, Schama, pg 142] It was said in a moment of frustration and anger, and probably not given as command, but it was all the anti- Becket faction needed. Four knights set out to murder the Archbishop while he was at Vespers in Canterbury Cathedral. 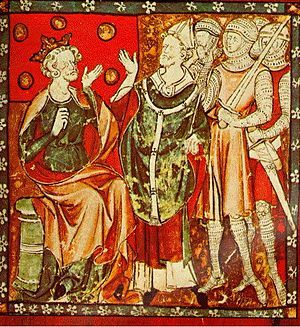 “Almost overnight Becket became a saint. Henry reconciled himself with the church.” [BBC.co.uk] He was genuinely grief-stricken over the loss of his former friend. He did penance at Beckett’s tomb and reversed the Constitution of Clarendon. Henry and Richard were at war in France when Henry took seriously ill. After so many years of refusing to name Richard his heir he was forced to do so at Ballan. He died on the 6th of July, 1189. We saw The Lion in Winter at the American Shakespeare Center in Staunton, Virginia last summer. It was an amazing theatre and an awesome Shakespeare (and historical) experience. Click on the link and check them out. This entry was posted on Tuesday, March 5th, 2013 at 11:29 pm	and tagged with Henry II and Eleanor of Aquitaine and posted in American Shakespeare Center, England, Europe, Henry II of England, History, postaday, Thought of the Day, Today's Birthday. You can follow any responses to this entry through the RSS 2.0 feed.